ideas to use during downtime – Hayden Consulting – Where Your Success in Business and Life Matters! These are just a few patient appreciation gift ideas. I’m sure you can come up with even more fun gift ideas. I would LOVE to hear all about what you come up with! Please share your stories and pictures with me here, on my Facebook page or via email.Thank you to all of you that have sent me messages and pictures of your gift ideas!! Don’t miss out on any of the ideas that I share each month! Are you receiving my complimentary Practice Management and Marketing Ideas in your email inbox each month? If not, please start following us today. If you prefer, send me your email address and I will send you an invitation to follow my blog. Feel free to tell your dental friends all about us so they can start benefiting from these dental ideas too. If you liked these ideas, please let me know by hitting the “like” button. Thank you!!! 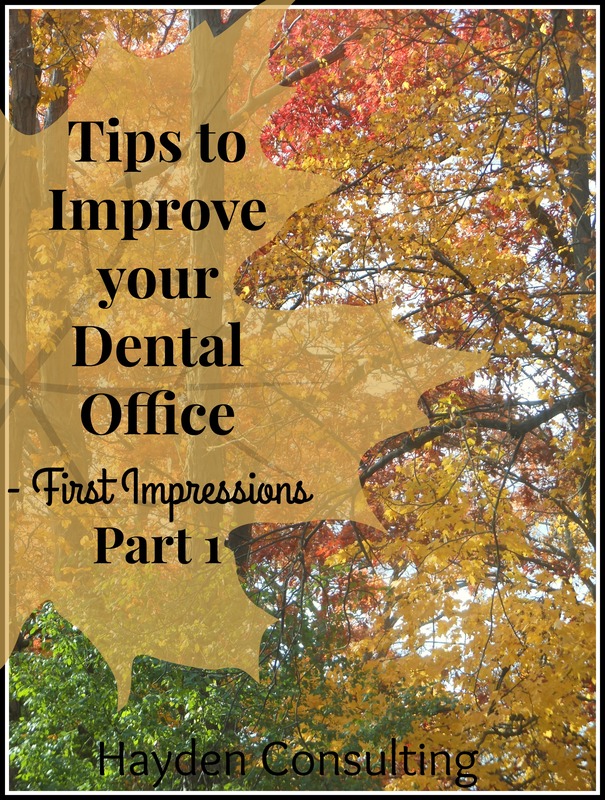 First impressions of your dental office matter just as much. Take/Make the time to look at your office with your patient goggles on. What does this mean? Look at your office building, the exterior and the interior as if you were a patient or a potential patient. Poor Signage? Dirty Windows? Weeds in the parking lot? Ugly landscaping? Garbage around the building? Safety Concerns? Next, walk in to the office through the main entrance, sit down together in the reception room. What do you see? hear? smell? Look high and low. Dirty carpeting/flooring? Outdated magazines & decor? Stained Chairs? Peeling wallpaper? Cobwebs? Dusty plants/floral arrangements? Light bulbs that are out? Static radio coming through the speakers? Look over at the front desk area, if you see a sliding glass window that is full of signs and papers telling your patients what to do and what not to do…remove them immediately! In fact, remove the glass. It’s very unwelcoming! Now, you’re going to want to go check out the restroom. Is it clean? Why does it matter so much that the restroom looks great? Because this is the only place your patients will visit unattended. What do they see? Filthy bathroom? Poor quality paper products? Drippy fixtures? Do the same with the rest of your office. Sit in the treatment room chairs. What do you see? What do you hear? What do you taste? What do you smell? How do you feel? Again, your patients can’t measure quality of care, they measure quality of their experience. Keep your patients loyal to your practice by making certain they consistently have great experiences. Now is the NOT the time to settle for less than the best. Work together as a team to see where improvements can be made and more importantly, act on them! Look around the office through the eyes of your patients, what do they see, hear, smell and feel? Make a plan to Improve Your Office. Make it Great! I love hearing your comments and idea’s, please continue sharing them with me. Remember, I’m happy to answer any questions and concerns you may have. Take a minute and check out Part 2 in my Improve Your Office Series. Make a cleaning schedule – who, what & when will the parking lot, restrooms & reception room be checked. This should be done several times throughout the day. Do not wait for the “cleaning person” to take care of those areas. Purchase hot/cold beverage tumblers, preferably with your office logo on them for your team members to use at their work stations – this looks much nicer than your patients seeing soda bottles or coffee shop cups. Make a promise as a team that when you see debris/trash you simply pick it up and throw it away. Keep the noise down! Patients want to be put at ease, they don’t want to hear the latest office gossip or a TV that is too loud. Avoid using patients full names or complaining about patients when you can be heard from the reception room or treatment chair. Have a lending library bookshelf in your reception room. Books that patients can borrow, keep or books that they can donate to your library. Fold the toilet paper in to a pretty fan shape. Seriously, when I would do this in the office restroom, I would get male patients coming out of the restroom asking me to show them how to fold the TP so they could surprise their wife. lol …true story. If this is all just too much for you, hire me to come in to your office and I will happily make it all happen for you! Contact me today at bhaydenconsulting@gmail.com.